The 2015 Atlanta Braves, notably in the second half of the season, made up one of baseball’s greatest laughing stocks in recent memory. After finishing close to .500 to end the first half at 42-47, a downward spiral began that saw the Braves go a dreadful 25-48 in the second half. They allowed 149 more runs than runs scored, and were a miserable team to watch not merely as a Braves fan, but also as a fan of baseball in general. Add to this the team’s fire sale, in which Kelly Johnson, Juan Uribe and Chris Johnson were all sent packing, and they sent promising 24-year-old lefty Alex Wood to the Dodgers for talented Cuban third baseman Hector Olivera and promising back-end reliever Paco Rodriguez. A good trade, but bringing on the bloated contracts of Nick Swisher and Michael Bourn in August greatly confused the baseball world. Who are the Atlanta Braves and where exactly are they headed? Swisher and Bourn aren’t guys a front office normally brings in during a rebuild, and it left many thinking John Hart’s Braves didn’t have a direction. That was, until they dealt last year’s staff ace Shelby Miller — whose 6-17 record proves the fallacy of the win-loss record in modern baseball — to the Diamondbacks last week and raked in a significant return. The only big league-ready player acquired by the Braves is 25-year-old outfielder Ender Inciarte, who in almost two full seasons showcased quality played vision (.303/.338/.408 in 2015), speed (21 stolen bases, but 10 caught stealing, in 2015), and defense (14.5 UZR in 2015). He may not even stay with the Braves — the Cubs have reportedly shown interest — but if he does, he looks to be a good commander in the outfield with potential as an effective leadoff hitter. With the trade of Shelby Miller, it was Atlanta’s farm system that got the most significant jolt of all parties involved. 23-year-old starter Aaron Blair, who went 13-5 with an impressive 2.92 in an even split between AA and AAA last season, came as part of the package. In three minor league seasons, Blair has a 3.22 ERA and 1.168, with a decent strikeout-to-walk rate of 2.81. That’s not to say he strikes out a ton of guys, because he doesn’t. He just doesn’t walk many, either. 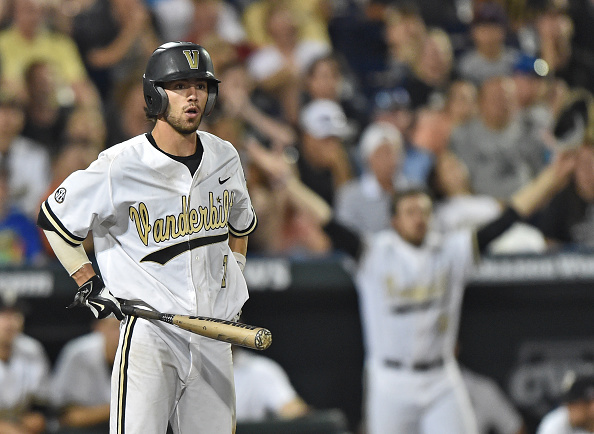 And then there’s Dansby Swanson, last year’s number-one draft pick for the Diamondbacks, a 21-year-old shortstop from Vanderbilt with superb plate vision and offensive abilities. Sure, he needs to work on his fielding, and some power may come in time (only one homer in 83 at bats at low-A Hillsboro last season), but the upside for this kid is through the roof, and some think he can evolve into a franchise player. It’s understandable that Tony La Russa, Dave Stewart and Co. in Phoenix are in “win now” mode, and with Greinke and Miller added to a team that boasts Paul Goldschmidt, Yasmany Tomas and A.J. Pollock offensively, they may contend in an NL West that has transformed quite a bit this offseason. It’s also not unfair to say the Braves probably got the better end of this deal in the long-term. This trade wasn’t Atlanta’s only move to bolster their farm. Earlier in the offseason — and easily forgotten with the wealth of big trades and free agent deals in the last week — Andrelton Simmons was sent to the Los Angeles Angels for Erick Aybar (now the likely stopgap at short until Swanson is ready), Chris Ellis and Sean Newcomb. Simmons is a superb defender with a very poor bat, and was an odd long-term investment for the Braves when he was given a seven-year, $58 million deal in 2014. The key to this trade is Newcomb, who between three levels of the Angels farm system went 9-3 with a 2.38 ERA in 27 starts (136 innings). He’s been impressive at every level since he was drafted 15th overall in 2014, and entering his age-22 season in 2016 he joins forces with Blair to give the Braves a nice arsenal of promising young starters down on the farm. And the Braves already have intriguing pieces from last season as part of this entire process. Adding Blair and Newcomb to the pitching crop of Touki Toussaint (Arizona’s 2014 first rounder), Lucas Simms, Kolby Allard and Mike Soroka gives them a vicious collections of arms on the farm. There’s even promise at the big league level: Julio Teheran, Matt Wisler, Williams Perez and Mike Foltynewicz all make up a rotation of pitchers 24 and under, and while their 2015 big league campaigns were wildly underwhelming, each starter has upside. On offense, despite being 30-years-old, Olivera could prove to be a huge pickup for the Braves as they progress. They also have infielders Ozzie Albies and Austin Riley in the lower levels and patient-hitting speedster Mallex Smith in the higher ranks, proving no shortage of offensive talent, either. And they still have their franchise first baseman Freddie Freeman locked up for some time, and he could still be the centerpiece to any rebuild effort in the future. By also trading Cameron Maybin to the Detroit Tigers for young relievers Ian Krol and Gabe Speier, sending Christian Bethancourt to San Diego for former top prospect Casey Kelly and catcher Ricardo Rodriguez and hinting at dealing Nick Markaikis just one year into his deal, Atlanta’s rebuild went from directionless confusion into a focused overdrive, seemingly planting the seeds for a respectable first season at SunTrust Park in 2017. These Braves won’t be ready to contend in 2017, because this puzzle is still in the process of filling itself out. But all of the aforementioned additions — Paco Rodriguez, Swanson, Blair, Newcomb, Krol, Speier, Kelly, not to mention the draft picks they’ve accumulated in the process — to Atlanta’s existing crop of talent sets the table for baseball’s next exciting rebuild process, now that the Cubs, Astros and Twins are all “there” entering 2016. This offseason only marks the beginning of an exciting new phase for the Atlanta Braves, and between the pieces they’ve taken on along with the ones that will come via trade or the draft in the coming several years, John Hart’s once-concerning plan may pay off after all come 2018 or 2019.